Avast antivirus Resident Protection will prevent HijackThis and Combofix from fixing an infection. 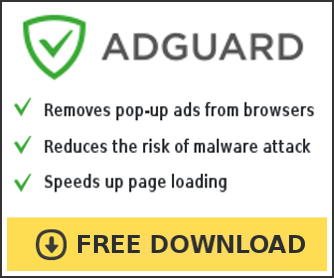 You must disable it before the start of the removal of spyware and malware. Use the instructions below to disable Resident Protection. 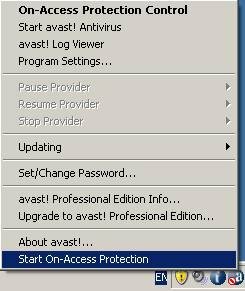 Right click to the Avast icon in Windows taskbar and you will see menu as shown below. Click to Stop On-Access Protection and you will see Confirm dialog as shown below. 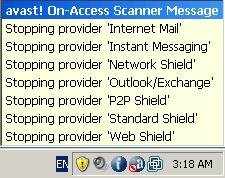 Click YES and you will see Avast On-Access Scanner Message as shown below. 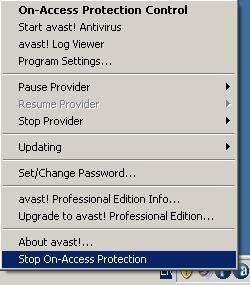 Note: For enable Avast antivirus Resident Protection make a right click to the Avast icon and select Start On-Access Protection, as shown below.